Ford: "We've got the balance about right." DETROIT -- Selling cars and trucks will not be enough to keep Ford Motor rolling for a second century, so the company is operating on parallel paths to prepare for self-driving cars and shared vehicles, according to Executive Chairman Bill Ford. "There's no question our business model will look very different in the future than it does today," the great-grandson of founder Henry Ford said Thursday in an interview. "Our management team understands we're going to be playing in two different worlds. On one hand, we have to deliver great cars and trucks today. And yet, we need intellectual horsepower aimed at charting a path through this very disruptive future." As more people migrate to big cities, new forms of transportation are needed to keep them mobile and avoid global gridlock, Ford said before speaking at the Mackinac Policy Conference, which draws business and political leaders to a Michigan island resort that outlaws autos and features horse-drawn carriages. Automakers that figure out a future with fewer auto sales and more car sharing will succeed, and those that ignore it do so at their peril, Ford said. "If we all collectively did nothing and we stayed with the current business model, we could just end up being assemblers of other people's stuff with a very low-margin, high fixed-cost business," Ford said, while sitting in a white caned rocking chair on the front porch of the 128-year-old Grand Hotel. "The company that figures out how to navigate this could really actually end up raising margins and changing the business model in a way that will be very healthy." Ford said this week that it will start offering a network of shared cars in London to tap the growing market for on-demand driving from companies such as Avis Budget Group's Zipcar. On Thursday, the automaker said it's hiring 200 engineers to work on electric and hybrid cars, while sharing patents with the public to accelerate development of alternative transportation. Last week, Fontinalis Partners, a venture capital firm co-founded by Bill Ford, said it invested an undisclosed amount in Lyft Inc., the ride-hailing service that competes with Uber Technologies Inc.
Ford, 58, whose great-grandfather's Model T provided affordable transportation to the masses a century ago, said in a statement on May 22 that companies such as San Francisco-based Lyft represent "the future of mobility." 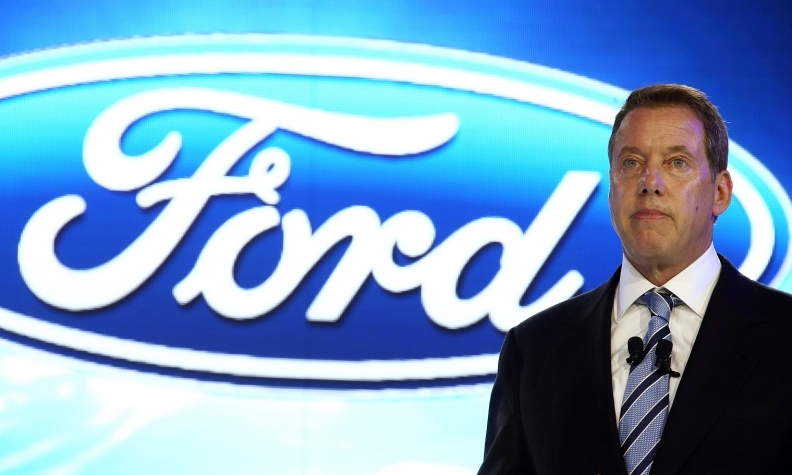 "There are a lot of different futures in mobility," Ford said in the Thursday interview. "Because autonomy, that's mobility. You've got connected car, you've got these different ways to access vehicles. You've got fractional ownership in Zipcar. You've got Uber and Lyft. In aggregate, it is changing the way we use our vehicles. And it's happening really fast." That's why executives at the second-largest U.S. automaker are focusing on both the current market and the future. "I feel great about our management team and the discussions we have around this because there's no defensiveness, everybody gets it," Ford said. "I think we've got the balance about right." For now, Ford Motor is expanding its geographic markets for cars and trucks. The automaker is opening four factories in China this year while introducing 18 models there, which follows a record 26 new-model introductions worldwide last year. Ford's F-Series line of pickups, the top-selling vehicle in the U.S. for the past 33 years, accounts for 90 percent of the company's global automotive profit, according to Morgan Stanley. Ford's net income fell 56 percent last year to $3.19 billion as it converted two factories to produce a new aluminum-bodied version of the F-150 truck. At the company's annual meeting this month, Bill Ford sought to assuage shareholders disgruntled with its stagnating stock price by saying profit will improve in the year's second half. "My family also owns a few shares of stock, so I do watch the stock price pretty much every day, if not hourly," he said at the May 14 meeting. Yet U.S.-based automakers face a dire future if they don't significantly shift their focus to self-driving cars and shared mobility, according to an analysis published last week by Barclays Plc. U.S. auto sales may drop about 40 percent in the next 25 years because of shared driverless cars, forcing mass-market producers such as General Motors Co. and Ford to slash output, according to the report by Brian Johnson, a Barclays analyst. Large-volume automakers "would need to shrink dramatically to survive," Johnson wrote. "GM and Ford would need to reduce North American production by up to 68 percent and 58 percent, respectively." Bill Ford contends that Ford Motor can avoid that scenario because it's already planning for the day when it sells fewer cars and offers commuters many different ways to get around. "I go back to my great-grandfather who said, 'If I asked my customers what they wanted, they would have said a faster horse,'" he said. "And then he created mobility for all. That's very much a part of our history. We just have to redefine it for the future."